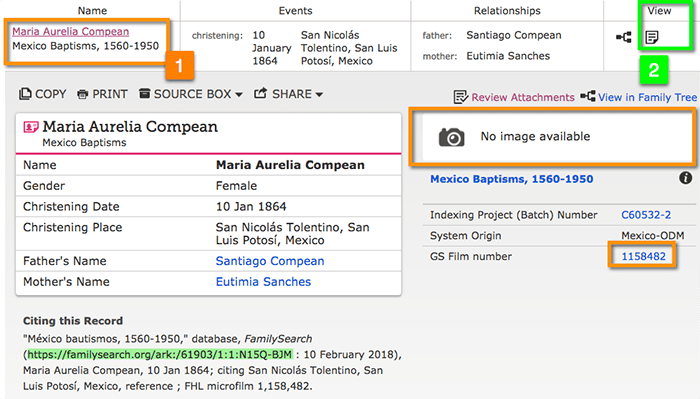 While doing last minute preparation on Sunday for my final lecture at the Texas State Genealogical Society’s excellent conference in San Antonio, I noticed a new feature on FamilySearch. They have rolled out an easier more direct way to access those unlinked (non-indexed, non-searchable, browsable-only) digitized collections. I wrote an article and tutorial on those collections back in 2015. Many of the digitized collections on FamilySearch have not yet been indexed and made searchable. These collections are often missed by researchers who only use the Search features on FamilySearch to access collections. Some records in these collections have indeed been indexed, but through earlier indexing projects like the IGI (International Genealogical Index), not through the current indexing projects. These older indexes still live on FamilySearch, and are discoverable using the Search Historical Research tool. However, they are not linked or connected to the actual digitized record image referenced in the index entry. The search results show these as simply an index entry of extracted transcribed data (see the paper icon highlighted in red in Figure 1 below, in the View column). If this index entry was attached to the actual digitized record image, a camera icon would show up to the right of the paper “index” icon. 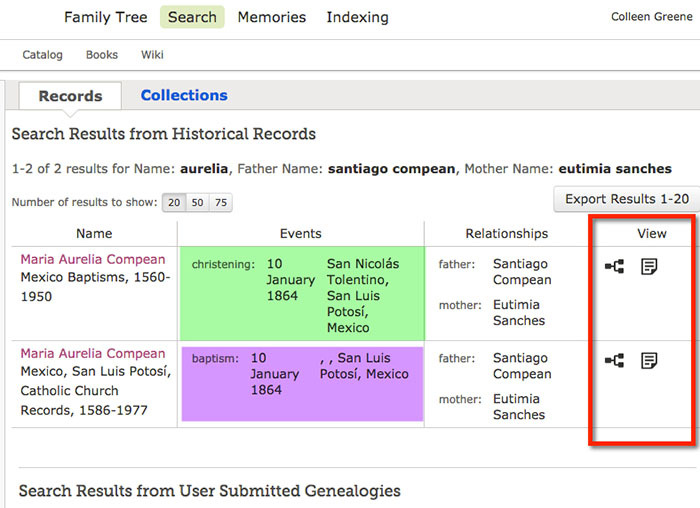 The pedigree icon on the left side of the View column means that those index entries are attached to someone in FamilySearch’s Family Tree. Figure 1: Both of these records are just index records, with no actual digitized document image attached. Otherwise a camera icon would be visible in the View column that is highlighted in red. 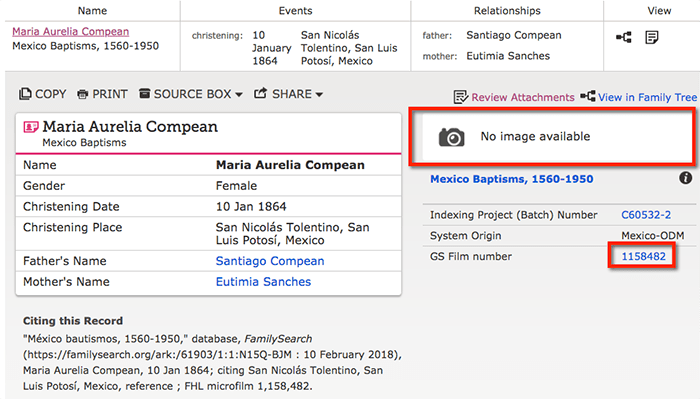 Both of the item records displayed here refer to the 1864 baptism record for my 2nd great-grandmother Maria Aurelia Compean Sanches; they just come from two different indexing projects. After clicking on the index entry “paper” icon in the View column for a particular search result, you might encounter the message I have highlighted in red in the screenshot below. FamilySearch appears to have recently added this new message to some index entry item records like the example I explained above. Figure 2 below tells us that the index entry item record pertains to a record collection that has been digitized and is available elsewhere on the FamilySearch website. That relevant collection just is not indexed and searchable itself…yet. But this new type of notation is a big help. The “Browse the film” link takes us directly to the specific digitized microfilm roll that contains the digitized record image for the life event referenced in this index entry. It is a shortcut message and link. Figure 2: Clicking on the Transcription “paper” icon in your search results now displays the message highlighted here in the red box if the index record is linked to a specific digitized microfilm roll. Previously, when encountering the item record for an unlinked (non-indexed, non-searchable, browsable-only) digitized collection, we would see the message highlighted in red in Figure 3 below, telling us there is “No image available.” We would then have to go into the Catalog and look up the microfilm number identified under that message (also highlighted in red). If the item record is linked to the specific digitized document image (versus to just the digitized microfilm roll), you would see an item record like the one below in Figure 4. Here the item record displays the camera icon in the View column as well as a preview of and link to the digitized record. 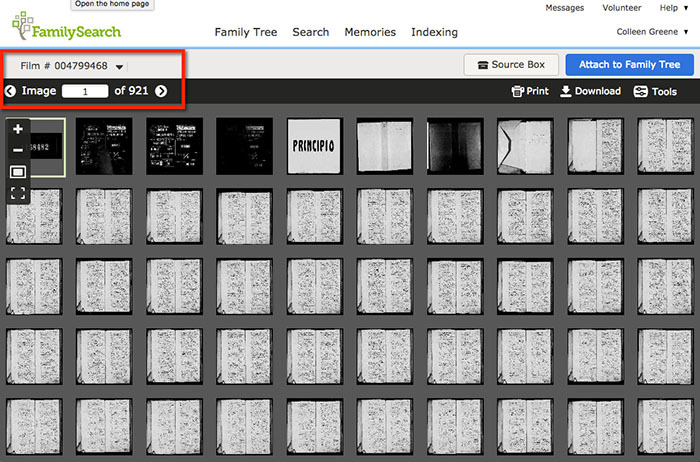 Figure 4: This is what an item record looks like when it is linked to the actual digitized document image. This is not the same record or focus person. 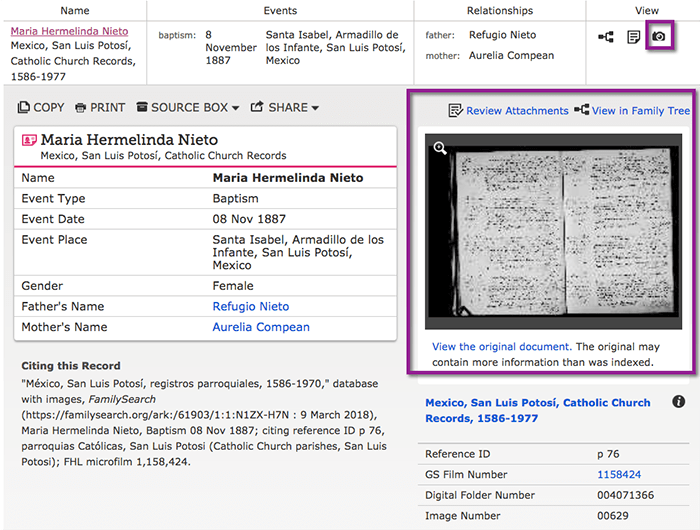 It is the 1887 baptism record for Aurelia’s daughter Maria Hermalinda Nieto Compean. In playing around more this week with this new feature, I encountered what (in my opinion as a web developer) is a web design flaw resulting in an inconsistent and confusing user experience. In the new feature highlighted in the scenario explained in Figures 1 & 2, sometimes that new message box and link shows up and sometimes it does not. I still kept seeing the message highlighted in Figure 3 (“No image available”), even for item records that I knew recently displayed the new message shown in Figure 2. This had me stumped most of this week. What I figured out is that the old message (“No image available”) is displayed whenever the user clicks on the Name link in the search results. Figure 5 below illustrates this. The Name field and link (highlighted in orange, and as option 1) opens up the item record details, showing the old message. The new shortcut message (shown in Figure 2, highlighted in red) is ONLY displayed when the user clicks on the transcription “paper” icon in the View column. I have identified that step in Figure 5 below as option 2 highlighted in green. Another way, although an awkward one, to get to the new view and shortcut message, is to copy and paste the item record permanent URL into your browser. That permanent URL is shown in Figure 5 below, also highlighted in green, under Citing this Record. Figure 5: This screenshot illustrated the inconsistent confusing behavior I encountered. In Option 1 (orange) the user clicks on the Name field and link and receives the old message. In Option 2 (green) the user clicks on the transcription “paper” icon in the View field and receives the new shortcut message. What is the added benefit of this new message and feature? Figure 6: Another look at the new shortcut message and feature. When you click on the “Browse this film” link in that new message, the system takes you straight to the particular roll of digitized microfilm that contains the relevant document image. Figure 7: The specific roll of digitized microfilm that contains the relevant document image. Instead of having to search the Catalog for that roll of digitized microfilm, that shortcut message saves you that step. Yes, you still have to go it old school scrolling through the microfilm images, just like we do with actual microfilm, to find your specific digitized document. But this is one step closer to FamilySearch connecting those old item index records from the old indexing projects to the growing collection of actual digitized documents. Hi Jill. No objection at all. Thanks. That’s good. I often abort my mission before I finally find the breadcrumb trail. Some collections are restricted and have to be viewed in the Family History Library, a Family History Center, or affiliate library (sometimes even affiliate libraries are excluded). This is due to licensing restrictions required by the repository that owns the original collections, and is not a FamilySearch decision. This is very common in libraries. The scenario you describe sounds like the above, so no, you will not see the new message or shortcut link on those collections. I think you should also see an icon that looks like the camera with a lock next to the transcription icon in the View column of the item record. Watch for this new message and feature on other collections. So sad that for someone like me it is nearly impossible to visit a Family History Library, a Family History Center, or affiliate library. I am often asking myself the same question – in this age of digitalised records, why am I , and others like myself, left not being able to access such records where others who have the wherewithal are not left out. When FamilySearch did away with their microfilm lending program late last year, their justification for doing so is because they are making it such a high priority to quickly digitize collections. They already have so much digitized, even if it’s not all indexed and searchable yet. I visit the Family History Library in SLC a couple times each year. My last trip was in early October, and almost everything I needed on microfilm was already digitized and available to me from home. Many of the monographs I needed to consult are not yet digitized, but the microfilm is. What records are you not able to access yet from home? It’s also important to understand how incredibly expensive it is to digitize collections, index them to make them searchable, and make those available remotely to online users (with constant server up time). I work in an academic library for a large public university, yet we have only digitized a few of our collections so far because of the considerable cost and infrastructure needs. So I’m very thankful for what FamilySearch has digitized already and makes available to us for free. Yes, some of those digitized collections are restricted to use within a FamilySearch facility or affiliate library. I discussed that in an earlier comment above. That is not FamilySearch’s fault. That is a licensing restriction imposed by the owning repository for those collections, and is very common in libraries and archives. Thank you for alerting us to this change! I browse films via the catalog all the time but this will save some time finding the original images.